Few tour guides can be counted on to show you something completely offbeat or unusual. And I, who can be counted on to tune out effortlessly from a tour guide’s ramblings, can be trusted to a fault to spot the unusual in the offbeat. Even if I say so myself. In May 2011, I travelled to Oman on assignment for Outlook Traveller at the invitation of the Ministry of Tourism (that story is archived here). There were countless backstories that I gleaned on that trip and this was one. Before that, a fact. But wait, even before that, a disclosure. I’m a Malayalee, a native speaker of the south Indian tongue called Malayalam. I cannot stress this point enough because I meet many educated (but obviously poorly travelled) people who can’t tell the difference and that, to me, is as irksome as that cardinal confusion between Hindi and Hindu that is at the heart of many American Desi coming out parties. Also note that I didn’t capitalize the ‘south’ in ‘south India’ because, unlike South Korea, it is not a nation; unlike South Dakota it is not a state; and unlike South America it isn’t a continent. So, to labour the point, my roots lie in Kerala. And though I live in Bangalore, also in south India, I speak my mother tongue well enough to save my life and get in a bit of trouble at the same time. The last, inevitably, is a gift. In the Sultanate of Oman, as of 2007, there were almost 135,000 Malayalam speakers who comprised 60 percent of the total expatriate Indian population in the nation. This is not strange or unusual because Oman was one of the countries in the Arab Gulf that welcomed immigrant workers in large numbers in the 1970s and 1980s, and Indians (at 20% of the total population of Oman) are the largest immigrant group. Many of these people are unskilled workers, many are skilled workers, about 10 percent are professionals and over 2,000 of them are doctors, many in senior positions. You can stop yawning. There’s a reason I’m trumpeting the influence of Malayalam in Oman and just how deeply invested my people and mother tongue are in this Arab nation. On that trip in May 2011, we drove from Sur to Muscat skirting the edge of the Hajar mountains on one side and the cerulean Persian Gulf on the other. We stopped en route at the stunning Bimmah sinkhole (a post on that later) and there I saw this notice for a missing person. 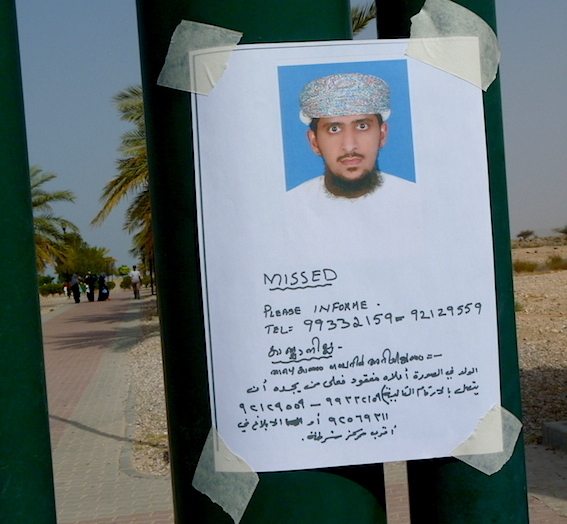 The unfortunate man was an Omani and I hope he was found alive and well. But I’d like to draw your attention to the order of languages on the notice: first, English, then Malayalam, and finally Arabic. Yeah, I’m thinking of that Neil Armstrong on the moon joke, too.